This is where William Morris was at school for 3 years, he lived in A house (interior, above left) with its simple winding staircase - now no longer a boarding house and filled with flags. The College Chapel has one window commissioned from Morris & Co. in 1875. As usual what I look for are the WM designed background patterns, a lovely dark green with bright orange fruit in the centre and a familiar looking acanthus leaf below. "The fact is, my dear fellow, that at present the absolute duties of my life are summed up in the necessity of taking care of my wife and my daughter, both of whom in one way or other are in bad health. My work of all kinds is really simply an amusement taken when I can out of my duty time". From a letter from WM to John Bruce Glasier, 1892. In the 1890s this amusing work was mainly for the Kelmscott Press, and as I read these late letters I became increasingly interested in the ornamental capitals that he was designing at that time. There are different plant types used seemingly randomly around the letters, as you can see in the open pages above, and also different ways of integrating the letter with the background foliage. The four letters on the left (above) are separate from the foliage, the next two show stems twining around the letters (and making them less legible as far as I'm concerned), while the two on the right are pierced by the stems of flowers and vine tendrils. There are lots of these pierced letters, their appearance is, to me, disturbing and 3-dimensional. "Thank you very much for sending me the drawing of Kelmscott. I think some alterations are needed. The chimney-stack mixes up too much with the gable, & is much too small I should say. The markings of the stone work joints are too black and heavy, and would give the block a sooty look. 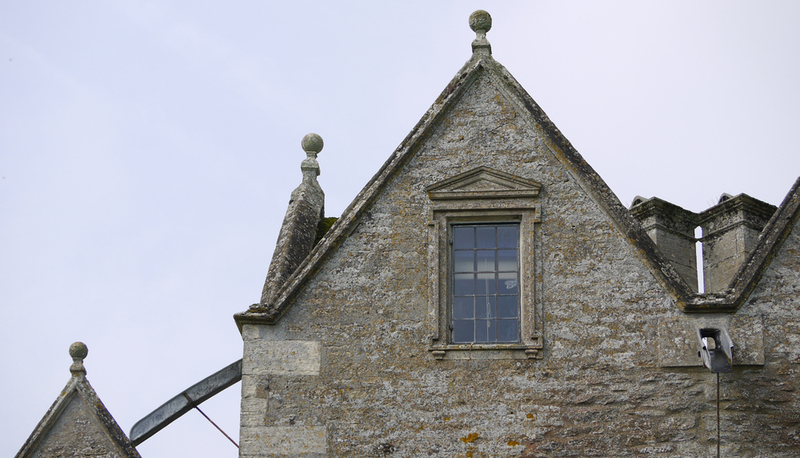 The copings of the gables are wrong I should say; I think some indication of their mouldings must be shown I think. I think also that the stone path up to the porch might be drawn with more literality. Again the plants against the house wall are vines and should have some indication of the habit of vines". From a letter by William Morris to Charles March Gere, December 20th 1892. There are many such discouraging letters from WM to his illustrators for wood-cuts for The Kelmscott Press, so I think I know the answer to the question of whether he would approve of my work. In my design (no 1. from the east) below, my chimney stacks are engulfed by the gables as I try to make sense of the geometry of the Manor. Design 1 is nearly finished and will be used for the first part of my glass and wallpaper installation in the Brewhouse.